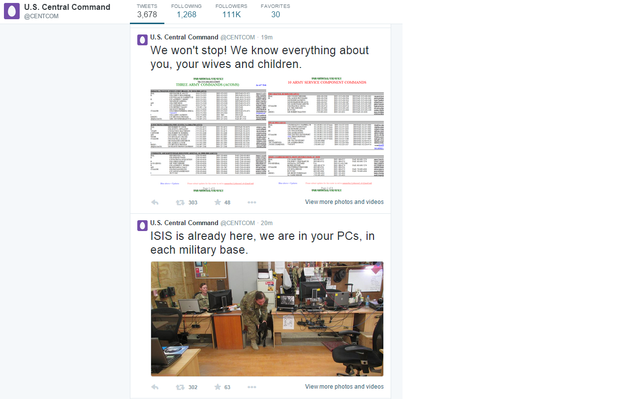 The U.S. Central Command Twitter account was hacked or at least defaced today apparently by ISIS (Islamic State of Iraq and Syria), posting tweets that threaten families of U.S. soldiers and claiming to have hacked into military PCs. Initially the hackers replaced the Central Command avatar with a black and white graphic of a person with their head wrapped in a keffiyeh with the words, “CyberCaliphate” and “I love you ISIS,” next to it. The U.S. Central Command Twitter account was suspended about 1:05 p.m. Eastern time. One tweet included a link to a Pastebin post that bragged about the success of an ISIS-run CyberJihad being run by a CyberCaliphate. “While the US and its satellites kill our brothers in Syria, Iraq and Afghanistan we broke into your networks and personal devices and know everything about you,” the post reads in part. Other tweets appeared to list names of specific military personnel. These listings apparently came from U.S. military phone directories that are posted online. The Pentagon could not immediately confirm that ISIS had in fact hacked the account.